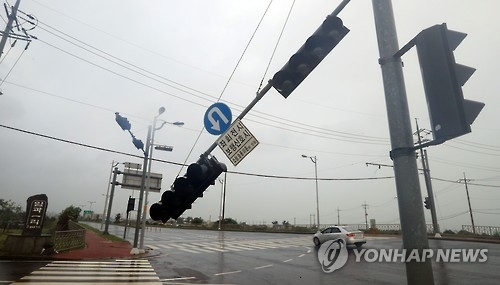 SEOUL, Oct. 5 (Yonhap) -- Heavy rainstorms struck South Korea's southern resort island of Jeju as well as other major cities on Wednesday, the safety ministry said, as Typhoon Chaba approached the Korean Peninsula. Five deaths have been reported so far, with another person missing in an area in the southern part of the country hit by the typhoon. Power went out at around 210,000 houses, while more than 70 percent of were restored as of 2:00 p.m., an official from the Korea Electric Power Corporation said. Typhoon Chaba, packing winds of up to 56.5 meters per second in some areas, is set to head towards Japan through the East Sea. Industry players also saw damage from the typhoon, with South Korea's top automaker Hyundai Motor Co. suspending a production line located in the southern industrial city of Ulsan due to some flooding. Daewoo Shipbuilding & Marine Engineering Co. on Geoje Island also shut down operations at its facilities in the region due to the weather.